Packing Way: one pp bag to each pc, 6 pcs per carton, or as per customer's requirement. New fashion men's winter hooded jacket 1. Shell fabric: 100% polyester 2. Polyester ling, cotton padding, feather at hood. 3. 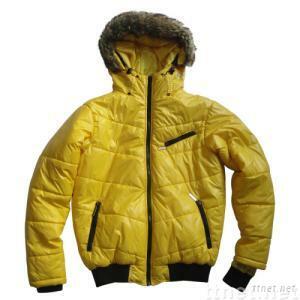 Waterproof and windproof, good wormanship, warm and comforatable. 4. Competitive factory price, small order acceptable. 5. Various models for selection, customer's design are welcome! 6. Sample time is 7 to 10 days. Production lead time is 30 to 45 days after receiving the deposit or order be confirmed. We own two factories located in Guangzhou city and Ruijin city respectively, have 8 years experiences in producing various garments, jacket and shirt are our competitive products, our company offer OEM service, welcome send us inquiries, we will do quote you best price!